The Duke of Edinburgh, Prince Alfred Ernest Albert, arrived in Wellington as captain of the frigate HMS Galatea. The first member of the British royal family to visit New Zealand, he was greeted with haka, speeches and bunting. Prince Alfred, the second son of Queen Victoria and Prince Albert, made three visits to New Zealand between 1869 and 1870. A planned visit in 1868 had been cancelled after a gunman shot and wounded the prince in Sydney. 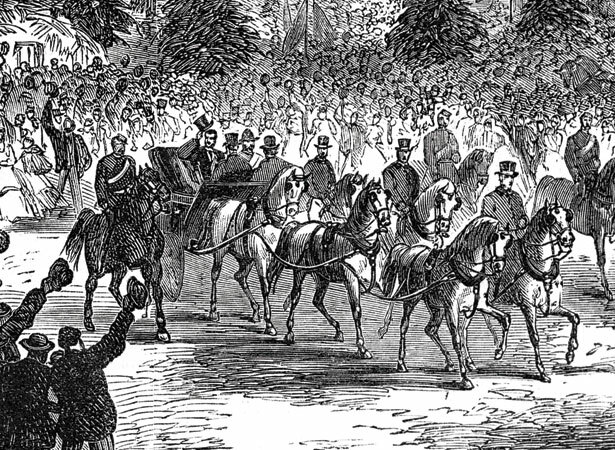 During his 1869 visit, the prince spent nearly a week in the capital, attending official functions and enjoying a pig hunt before sailing to Nelson. He subsequently visited Christchurch, Dunedin and Auckland, where he received 150 Māori chiefs and shot pūkeko and pigeons. The prince’s vessel returned briefly to Wellington in late August 1870 and made a final visit in December. To commemorate the royal tour, Galatea district in Bay of Plenty was named after the prince’s vessel. The name was originally applied to an Armed Constabulary redoubt built during the hunt for Māori resistance leader Te Kooti. We have 3 articles, 1 comment related to New Zealand's first royal visit . My grand father was a chef on the train from Auckland to Wellington for some royal visit. i have a photo of him in the carriage.